The Hillsborough County Library System tries hard to be all things to all people. Perhaps too hard. According to the editorial, the libraries are doing all sorts of things. They’re community centers. They have computers. They have game nights, for crying out loud. And all this takes away from their main purpose: books. Today, the top priorities are more computer labs and more public meeting space. Book collections are deliberately being kept small. So make no mistake about it. The construction of new branch libraries is mostly about adding value to neighborhoods, not about getting more books to more people. Now, while I think this editorial overstates things a bit, there is something to ponder in all this. We are trying to be all things to all people. And….warning, shock alert….we’re not doing a very good job of telling our story, and explaining why we’re doing all the things we’re doing. For library purists, it’s sad to learn that neighborhood libraries aren’t cherished for the printed word, but for the computers, meeting space and game events. Given this new reality, Hillsborough’s library system needs a new strategy. If we want to make libraries de facto community centers, how they are financed should be reconsidered. It’s time to look at the library system with fresh eyes, and for leaders to tell squeaky-wheel advocates that they can’t have it all. Ah. There’s the punchline. If there is one group thinking this way, there are others. And our libraries are going to start having to answer tough questions about what they’re doing and why. If what you’re doing makes sense, and is congruent with the mission of the library in serving its community, then make sure you polish your story. If, however, you’re offering services only because you read an article somewhere and didn’t fully consider whether it’s appropriate for your library and your community, you may want to reconsider. Man, I am in deep trouble – at least I am if I move to Wilkes-Barre, Pennsylvania. John Puchniak quite literally lives in a sea of books.He reads constantly except when he’s haunting bookstores, libraries and, when he’s able to get there, the Philadelphia bookstore that he co-owns. He filled his house with about 3,000 texts until it was repossessed by the bank, which agreed to move them all to an apartment Puchniak rented on North Main Street specifically because there was plenty of storage space. Now, there’s a photo of John’s apartment and granted, it could be organized a little better. But the reality is that there are a lot of folks (ahem) that have large collections of books. Fire hazard? I suppose so. Books are flammable, after all. The Open Library project launched yesterday. What if there was a library which held every book? Not every book on sale, or every important book, or even every book in English, but simply every book—a key part of our planet’s cultural legacy. But most importantly, such a library must be fully open. Not simply “free to the people,” as the grand banner across the Carnegie Library of Pittsburgh proclaims, but a product of the people: letting them create and curate its catalog, contribute to its content, participate in its governance, and have full, free access to its data. In an era where library data and Internet databases are being run by money-seeking companies behind closed doors, it’s more important than ever to be open. Earlier this year, a small group of people gathered at Internet Archive’s San Francisco office to discuss whether this was possible. Could we build something so grand? We concluded that we could. We located a copy of the Library of Congress card catalog, phoned publishers and asked them for their data, created a brand new database infrastructure for handling millions of dynamic records, wrote a new type of wiki that lets users enter structured data, set up a search engine to look through it all, and made the resulting site look good. We hooked it up to the Internet Archive’s book scanning project, so that you can read the full text of all the out-of-copyright books they’ve made available. And we hope to add a print-on-demand feature, so that you can get nice paper copies of these scanned books, as well as a scan-on-demand feature, so you can fund the scanning of that out-of-copyright book you’ve always loved. But we can only do so much on our own. Hopefully we’ve done enough to make it clear that this project is for real—not simply another pie-in-the-sky idea—but we need your help to make it a reality. So we’re opening up the demo we’ve built so far, opening up the source code, opening up the mailing lists, and hoping you’ll join us in building Open Library. It sure is going to be a fun ride. This will be very interesting to watch. And if this takes off, it will change things. There’s an amusing game going on at MPOW. 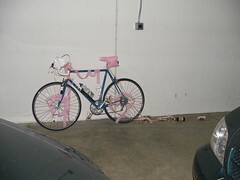 The folks in the IT area have started pranking each other. First a couple of the guys pranked Aurora, my Internet Librarian buddy. No doubt, there will be a retaliatory move. Should make Fridays all the more fun. Revenge: Step 2 Originally uploaded by superturbo. A Kane County library district has resorted to legal action to dislodge Dundee Township officials from office space in a building that the agencies have shared for more than 30 years. But the township has no intention of moving, Supervisor Susan Harney said Thursday. Nancy Dowd has a thought-provoking post on her terrific blog, The “M” Word – Marketing Libraries. She springs her post from a New York Times article on how women are building their businesses. We know from our own experiences that most women go about building a business from the heart and soul then integrate the growth in their life between all the other things they already have going. Businesses plans and budgets usually come along somewhere down the road… sometimes toward the very end of the road. But what struck me about this article was the idea that libraries could serve as a great place to network BUT and this is a really important part- we would need to stage the meetings to be conducive to the kind of networking that makes women comfortable. And that means making it hip, chic so speak. The best performance I ever went to was to hear Ellis Paul in a library but I have to tell you, I had to close my eyes to block out the atmosphere because it was such a stark room. Ah, yes. The old How Ugly Is Your Library? conundrum. Luckily, Nancy has some practical ideas for spiffing things up a bit, and for drawing this audience to your library. Have a look. And then have a program! Dorothea at Caveat Lector has a wonderful post on the recent New York Times article on librarians. For those of you who haven’t heard about this article, it talks about librarians and how “hip” we now are. How some of them are tattooed! And wear cool clothes! And are even GUYS! This image stuff? Is fiddling while Rome burns, people. It doesn’t matter what particular image the media decides to paste on us on a given day. What matters is that all they notice is image. They haven’t got a frickin’ clue what we do or why it matters. Exactly. And frankly, I find the article to be rather patronizing. I’ve often wondered where all of this hand-wringing over image comes from. I came to librarianship later in life, after having tried on a few different hats. I’ve never been in a group of opticians or stockbrokers or higher education folks and had this conversation. (“But what is our image as brokers?”) Why on earth are we as a group so concerned with this nonsense? Who CARES whether the image of The Librarian is some older woman with a bun, glasses, and sensible shoes? How do we fix this? We damned well say no, loud and clear, the next time some brainless style reporter shows up to play image games. We say no. We say “you write about what I do at work, or you don’t call me a librarian in your article.” We say no. We say “I’m sorry, how is this story you’re planning relevant to libraries and librarianship?” and if they don’t have a damn good answer, we say no. “I’m going to revamp the buns-and-shushing image of librarianship!” is not a damn good answer. It’s a damn bad answer. In fact, it’s unacceptable. So what do we say to it? We say no. As I’m fond of saying, you will not get a group of accountants sitting about, wringing their hands over their image. We need to get over this, people. Right. Now. It’s juvenile and distracting. Wear what you want. (Though I would say that dressing professionally is appropriate for any professional, but that’s another blog post.) Do what you want to in your spare time. Tattoo and pierce whatever. But for crying out loud, quit perpetuating this nonsense by continuing to whinge about it. DH is watching pro bowling on television. It’s been playing multiple times during every commercial break for an hour. The song is bad enough……and if I hear it one more time….. The placement of advertisements needs to be done in such a way as to grab the right audience, get their attention, and then entice them to take advantage of whatever it is you’re advertising. At this point, Denny’s is off my restaurant list. Not that it was ever really on it, mind you, but the annoying commercial repetition has sealed the deal. Whoever placed those ads in that rotation should be out of a job. Here’s the segue to library stuff, in my mind. When librarians are choosing to advertise, do they know where to advertise? And how often? Too often, librarians are tasked with the job of promoting the library without being given much direction in how to do so. Certainly, this sort of thing isn’t taught in library school. So how do you know if you’re just irritating the audience instead of enticing them? We hold these truths to be self-evident, that all men are created equal, that they are endowed by their Creator with certain unalienable Rights, that among these are Life, Liberty and the pursuit of Happiness. –That to secure these rights, Governments are instituted among Men, deriving their just powers from the consent of the governed, –That whenever any Form of Government becomes destructive of these ends, it is the Right of the People to alter or to abolish it, and to institute new Government, laying its foundation on such principles and organizing its powers in such form, as to them shall seem most likely to effect their Safety and Happiness. Prudence, indeed, will dictate that Governments long established should not be changed for light and transient causes; and accordingly all experience hath shewn, that mankind are more disposed to suffer, while evils are sufferable, than to right themselves by abolishing the forms to which they are accustomed. But when a long train of abuses and usurpations, pursuing invariably the same Object evinces a design to reduce them under absolute Despotism, it is their right, it is their duty, to throw off such Government, and to provide new Guards for their future security. —Such has been the patient sufferance of these Colonies; and such is now the necessity which constrains them to alter their former Systems of Government. The history of the present King of Great Britain [George III] is a history of repeated injuries and usurpations, all having in direct object the establishment of an absolute Tyranny over these States. To prove this, let Facts be submitted to a candid world. This past weekend DH and I traveled to Milwaukee for two momentous celebrations: our granddaughter’s first birthday and the 25th anniversary of Fr. Mike’s ordination. 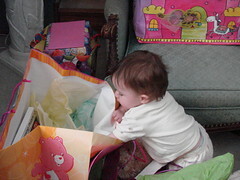 Alannah had a great time ripping open the tons of gifts she was given, and toddling about the place. She had taken her first steps 13 days before, and had evidently mastered the walk. By the end of the day she was toddling about like a drunken sailor since she was so tired, but she was determined not to give in to sleep when there was so much to see, so much to explore. 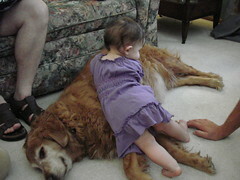 Ginger served as a resting place for a while, though. The next day, we celebrated Mike’s ordination anniversary. Mike, who is DH’s older brother, had the celebration organized and planned, and had a whole day of festivities, starting with Mass. 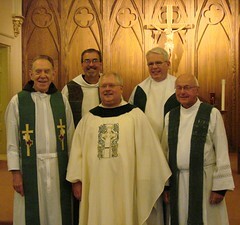 He had four priests con-celebrate with him, including a man he went to seminary with and had known since they were 14. Since Fr. Larry has been in Latin America for 25 years, I had heard much about him but had never met him. It was a pleasure to be able to do so….and it was a pleasure to be able to celebrate with Mike.